087-2992368 for an instant quote. At Galway Djs your event is just as important to us as it is to you. When you choose Galway Djs you are choosing a DJ with professionalism, experience and know how. We are one of the biggest DJ hire companies in Connacht so when you book through us you know you will be getting a professional DJ. Our DJs have lots of experience and are playing at different events around Galway and Connacht every weekend. All our DJs have a wide range of songs and can adjust the music to suit the age group and the mood of your party or wedding. Have you booked the entertainment for your wedding yet? For the best Wedding DJs in Galway contact Galway Djs. We provide professional DJs to play after a band or for full weddings. After playing at weddings every weekend for the last 5 years we can safely say that no one does them better. We still have a few dates available for this year so contact us now for a quotation. Have a look at our Wedding DJs in Galway web site for more details about our wedding services. We have an irresistible package deal at the moment with a photo booth and dj for only €500. 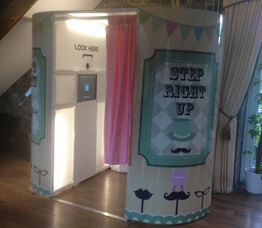 Photo booths are a must have if you are organizing any large party or event. We have lots of props to choose from and your guests will be able to take away a picture at the end of the night that will bring back memories of your event long into the future. © Copyright Galway DJs 2001 - 2016. All Rights Reserved.